Amazon might be getting all the press but they're not the only ebookseller in China. The online retailer Dangdang has been operating an ebookstore in China since late 2011, and next month they plan to ship their second ereader. The rather unremarkable new Duocon is going to come equipped with an HD E-ink screen, Wifi, 8GB of storage, and will cost 699 yuan (about $114 USD). 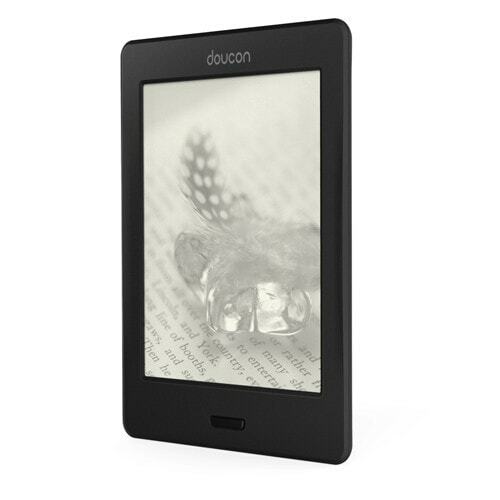 Like its predecessor (as well as many other ereaders), the second-gen Duocon has a touchscreen, and it improves on that earlier model with a faster CPU, higher resolution screen, and a frontlight. This ereader is running an unknown OS on a 1.2GHz CPU with 256MB of RAM, and it also has a speaker and headphone jack. Screen resolution matches the new standard of 1024x758, and like the current Kindle ereaders this ereader is missing a card slot. eBook format support includes Epub, PDF, Mobi, and PRC. This ereader can also play MP3, Wav, and OGG audio files as well as display common office formats like DOC, PPT, txt, html, and XLS. The Duocon is supported by an on-device ebookstore, which is stocked with around 100,000 titles. That's more than double the number of titles Dangdang carried when the ebookstore launched in December 2012, and it is also more than twice as many titles in the Chinese Kindle Store. Dangdang is pricing this ereader at 699 yuan, which a decent discount from the Kindle Paperwhite's retail price of 849 yuan. The Duocon will ship on 15 July.